Ideally, the gpu_formats_support struct would know which of the formats we can use as render targets. However, it was tempting enough to performs the checks in-place (at get_precomputed_render_passes) as opposed to having a field per format in the support struct. So I went the easier route. Let me know if you'd like the support struct to do the queries instead. Coding style issues aside, isnt this incomplete? What happens when the application requests a format to draw into that is not supported? You will end up with a null render pass handle. Also, due to complicated reasons, you cannot just exchange/emulate color formats easily due to how games use them. Which are these formats missing from metal/gfxrs? At least throw when use of unsupported formats is attempted and mention that its because of driver incompatibility. @elhaya thanks for testing it! I'll debug it on a real Vulkan driver to see what's going on. Did you build it yourself on Windows? In which case, could you build it with Debug information and provide the full call stack? That would be very helpful. What happens when the application requests a format to draw into that is not supported? You will end up with a null render pass handle. 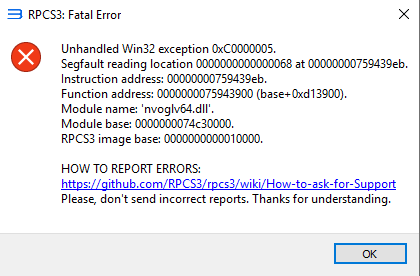 Yes, if a render pass is not possible on the Vulkan driver, then RPCS3 will need to crash gracefully on an attempt to use such a pass. This is better than crashing at initialization without knowing if the pass is going to be ever needed in the first place. Which are these formats missing from metal/gfxrs? Unfortunately, Metal on MacOS (specifically, there is no such restriction on iOS/tvOS) doesn't support packed 16bit color formats, such as R5G6B5 or A1R5G5B5. At least throw when use of unsupported formats is attempted and mention that its because of driver incompatibility. I can add this throw for sure. @MSuih thanks for the info! @kd-11 also note that precompute_render_pass was already returning nullptr in some cases (no color or depth buffers), so my PR doesn't introduce the case where a render pass is not created, it just makes this case happen more often, legally. makes sense for the variable usage, but I still think a helper function is better suited for that. I feel all these can be simplified by using a helper function in the anonymous namespace that has the precomputed passes func to avoid duplication all over the place. Declare as inline ofc. This should not have been an issue since there is no renderpass configuration with no color or depth buffers. Any such configuration sets the framebuffer_status_invalid flag and no rendering takes place. This is true for both OGL and Vulkan. We use BGRA8_UNORM for backbuffer surfaces, and the text-out pipe writes directly to it. If you intend to keep this as a debug assertion for documentation reasons just simplify this to a one line verify(HERE) renderpass != VK_NULL_HANDLE; since its technically impossible to hit this assert. @kd-11 thanks for the quick review! I addressed all the notes except for the helper method. Good to merge once @MSuih confirms his crash issue is resolved. Did a couple of quick test runs and coudn't trigger any crashes.